Geert Wilders, party leader and founder. The Party for Freedom, Dutch: Partij voor de Vrijheid (shortened PVV), is a right-wing political party in the Netherlands. 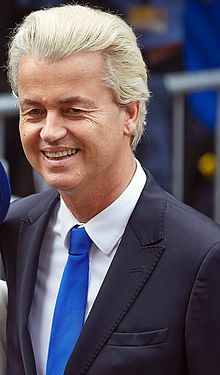 The party leader is Geert Wilders. The party was founded on 22 February 2006. In the 2006 Dutch general election, PVV won 6 seats in the House of Representatives with 579,490 votes. In the 2010 elections, PVV won 24 seats with 1,435,349 votes. In the 2012 elections, PVV won 15 seats with 950,263 votes. In the 2017 elections, the PVV won 20 seats (+5) with 1,372,941 votes. PVV is Eurosceptic, meaning they are against the European Union. They are also openly very critical of Islam. Economically, the party supports economic liberalism and wants to lower taxes. It is also a populist party. The PVV gained a great amount of popularity in 2017, coming second in the election. ↑ "CAPTAIN PEROXIDE Who is Geert Wilders? Dutch politician and Party of Freedom leader". thesun.co.uk. 31 October 2016. Retrieved 12 January 2017. ↑ "The Netherlands' most popular party wants to ban all mosques". independent.co.uk. 28 August 2016. Retrieved 12 January 2016. ↑ "Dutch party wants to outlaw mosques, Islamic schools, Koran". Politico. 26 August 2016. Retrieved 12 January 2016. ↑ "Dutch far-right Party for Freedom tops polls as Europe's 'populists' gain momentum". Russia Today. 29 November 2016. Retrieved 12 January 2017. ↑ "PVV stijgt door; GroenLinks grootste op links". ioresearch.